It was, to say the least, one of the more novel moves of the winter transfer window or, technically, two of them. A day after taking his leave of Premier League side Sunderland AFC to join FC Augsburg on a six-month contract, it was revealed that Dong-Won Ji will subsequently switch to Borussia Dortmund, penning a four-year deal valid from 1 July. Sporting director Michael Zorc was understandably pleased to announce that BVB “have been able to sign up this versatile attacking player for next season on a free transfer” – doubtless all the more so given that Sunderland had only last summer rejected a hefty bid from an unnamed Bundesliga club for the 22-year-old South Korea international. Securing his services will go some way towards plugging the gap left by star striker Robert Lewandowski's end-of-season departure for FC Bayern München. For Ji meanwhile, the prospect of earning his corn in the Bundesliga with the 2013 UEFA Champions League finalists amounts to a sea change in his personal fortunes after a sobering two-and-a-half years on the books at the north-eastern English club. First up, however, is another half-season stint in provincial Bavarian Swabia, mirroring the pattern of the 2012/13 campaign, albeit under radically different circumstances. This time last year, Augsburg were preparing for the league restart joint-bottom of the table on nine points, ten shy of the non-relegation zone and with a single win to their name. But come the end of the season, Markus Weinzierl's men were sitting safely in 15th place on 33 points, on the back of a tremendous run down the home straight. 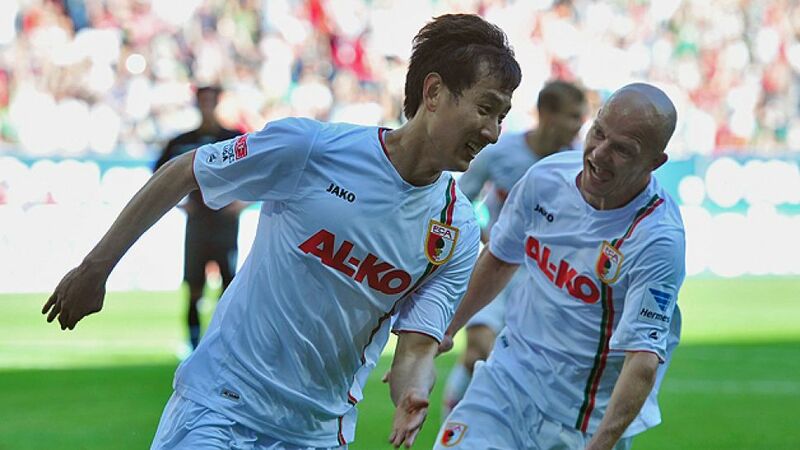 Ji, signed on loan during the winter break and given the regular starting berth denied him at Sunderland, had chipped in with five goals and a generally revitalising effect on a previously toothless Augsburg attack. For the rangy, two-footed and technically adept striker, it was a welcome return to the sort of form that had convinced Sunderland's then-manager Steve Bruce to snap him up from Chunnam Dragons as a relatively raw 20-year-old prospect in the summer of 2011. Not that Ji was a complete newcomer to the English game even then, having spent 2007/08 in the youth ranks at Reading FC as part of a Korean FA initiative. It was back at school in the southern city of Gwangyang, however, that his playing career really began to take off. Gwangyang Jecheol High supplies the U-18 team for Korean top-flight perennials Jeonnam (formerly Chunnam) Dragons and is widely regarded as offering one of the best programmes in the country for aspiring professional footballers. Ji, who grew up on the small island of Chuja and started playing football at ten for the school team on nearby and much larger Jeju Island, swiftly progressed through the youth ranks on the mainland and made his competitive debut for Chunnam in February 2010. The 18-year-old's first professional goal followed a month later and at the end of the same year he took his senior international bow in a friendly against Syria, marking the occasion with the only goal of the game. The following month, Ji hit the net four times to help South Korea to a third-place finish at the 2011 AFC Asian Cup in Qatar and that summer, Sunderland came calling. His stint on Wearside was to prove frustrating for player and club alike, amounting to the sum total of 24 Premier League outings, only four of them from the start. A last-gasp winner at home to Manchester City on New Year's Day 2012 provided a rare highlight and twelve months later Sunderland, Augsburg and the player himself agreed terms on the temporary deal that was to eventually open up a whole new horizon. In stark contrast to the first time around, he joins a club riding a wave of success they could scarcely have foreseen themselves, sitting pretty in eighth place on a healthy 24 points. Consolidating that position and reaffirming his own ability to produce the goods in another of the world's top leagues are the initial targets. Beyond that, there is the global football extravaganza in Brazil to look forward to this summer – and then a fresh start at one of the Bundesliga's, and Europe's, most dynamic and exciting clubs, to the backdrop of the biggest average crowds in the world game. For Dong-Won Ji, it looks like the only way from here is up.